Social networking levels the playing field, allowing for more voices to be heard and ideas to be spawn from the "bottom up." The social enterprise no longer carries a negative connotation and instead suggests forward thinking, superior internal communication and accelerated global connectivity.  This white paper takes a look at the adoption and evolution of social IT within ServiceNow.